ATLANTA — On Easter morning, a few hours before Michigan's Elite Eight matchup with Florida last Sunday, assistant coach Bacari Alexander approached student manager Jamie Peretzman with an unusual request. Alexander urgently needed a can of Pringles potato chips. "I didn't really know how many places would be open Easter Sunday, but I found this shady corner store that happened to be open," Peretzman said. "I wasn't sure what he needed it for, but I brought a can of Pringles back to the locker room." 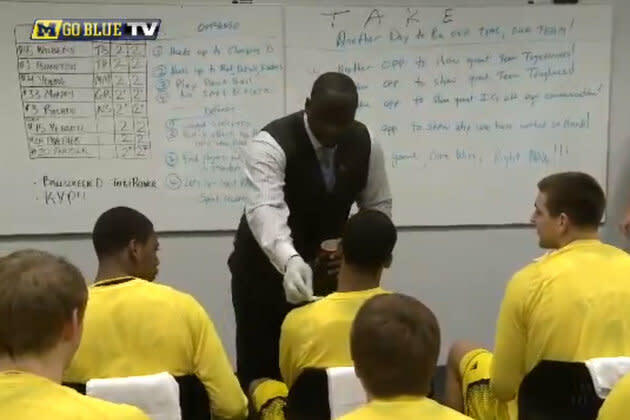 The purpose of the shopping trip became clearer just before tipoff when Alexander took out the can during his pregame speech and placed a single Pringle on the left shoulder of each Michigan starter. The message was for Michigan to play with a chip on its shoulder, something the Wolverines clearly took to heart in jumping to a 23-5 lead before Florida even knew what happened. "I came up with the idea because I saw one of the managers in the lobby eating chips, and I had an 'aha' moment," Alexander said. "I thought to myself, if we're going to have any success against Florida, we're going to have to play with a chip on our shoulder, so what a great, corny way to drive that point home." If Michigan players got a chuckle out of Alexander's speech, they certainly weren't caught by surprise. The assistant coach has used an array of props to emphasize certain pregame messages in the Wolverines locker room. Alexander wanted to encourage Michigan to stick together before one game this season, so he asked a handful of players to stand up, then wrapped them in athletic tape. He donned a hard hat and unveiled a maize and blue sledgehammer another game because the Wolverines needed to do the dirty work to win. Before a loss to Ohio State, Alexander produced two game tickets and told his team they were tickets to the "nutcracker." "He's always coming up with ways to lighten the mood and keep us loose," senior guard Matt Vogrich said. "His personality is pretty funny. He helps us get our mind right and get excited to play basketball." Alexander wouldn't reveal what he has planned for Saturday's Final Four game against Syracuse, but he did offer a hint: Not surprisingly, it will probably involve making orange juice. "When you get into the NCAA tournament and the stakes start to raise and the media attention starts to intensify, you have to find something to ease the mood," Alexander said. "One of the approaches we take is allowing our assistant coaches to address the team any way they see fit. One of the things I try to emphasize is to give them something that's not only humorous but also pertains to what we're trying to accomplish."